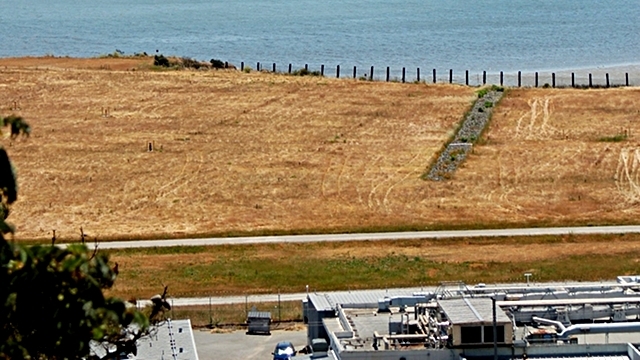 Landfills, like this one at Hunter’s Point, produce methane, which can be used for electricity and fuel. Photo: kqedquest. Trash that ends up at a landfill is the ugly stepsister of hipper, cooler compostable kitchen scraps and recyclable bottles and cans. But landfill trash has more of a future than you might think. As garbage decomposes, it gives off methane. Methane, when floating around in the atmosphere, is a harmful greenhouse gas; it traps 20 times more heat than CO2. But methane’s other moniker is natural gas, and is an important energy source. Methane from landfills can be captured and used to generate power and fuel vehicles—often the very same garbage trucks that brought the trash to the landfill in the first place. Landfills are not just giant heaps of rotting trash. At the base and sides of a landfill, the trash is separated from the natural world by thick plastic liner, which prevents the effluvia from decomposing garbage from entering the environment and contaminating the groundwater. The trash itself is strategically stacked in layers of cells—landfills can be hundreds of feet deep. Within the landfill, different microbes break down the trash via anaerobic digestion. The microbes produce methane gas as a waste product. There are other gases produced too; this mix of gases produced by anaerobic microbes is called biogas. Old landfills are punctuated by pipes that collect the biogas, which is then burned to prevent the gas from entering the atmosphere (and prevent the neighbors from smelling the stink). Open flares are just what they sound like—little burning flames of methane. Closed flares filter out the contaminants before the smoke is released. Flaring the biogas at the landfill is probably the most common way of dealing with it. But it is an unfortunate waste of a potentially valuable fuel source. Newer landfills are built with methane collection in mind from the early stages of construction. Pipes can be buried in the landfill as it is filled with trash. Pipes can also be placed in wells drilled through the trash after the landfill has begun to be filled. A vacuum system collects the gas as the microbes produce it. The amount of gas a landfill produces depends on the volume of trash and the age of the landfill; eventually, the gas production will peak and then begin to taper off. Today’s big landfills, however, can produce biogas for decades. The methane collected from landfills can generate electricity via a turbine or internal combustion engine. Often some of the electricity is used at the landfill to run equipment, and the rest is sold to the local utility. Methane from biogas can be converted to compressed natural gas, which can be used as fuel for vehicles. In some areas, regulations stipulate that large fleets of vehicles (with more than about 50 trucks) are required to run on clean fuel. When biogas is converted to compressed natural gas, the vehicles can refuel at the landfill. Building a system that converts biogas into compressed natural gas is a big investment, but the fleet saves on fuel costs for decades. These kinds of biogas systems can be installed at anaerobic waste digesters at places like wastewater treatment plants, not just landfills. Altamont Landfill has taken things a step further, converting landfill biogas into liquefied natural gas. First, impurities are removed, and then the gas is cooled down to a liquid state. This liquefied natural gas is used to fuel Waste Management’s garbage trucks. Altamont Landfill’s liquid natural gas system is the largest in the world. Obviously, we should buy only what we need, recycle what we can, and be careful to compost everything that’s compostable. But it’s nice to know that something useful can come from plain old trash. srpe per3 i think its great that methane gas is produced from trash. it would be alot more convenient if the microbes could be collected from the landfill and given to us so we can dump it in our trash and get some gas. it might also be better if we connect all landfills into one big landfill so we can produce more methane.